Partnerships are very important for the spread of the Gospel. We are grateful that Chris can focus on developing software that accelerates Bible Translation and distribution. Recently, his organization partnered with Faith Comes by Hearing (FCBH) and Renew Outreach to make changes to Scripture App Builder that will allow them to open new doors to distribute Bible apps with text and audio to minority language communities. FCBH has Bible recordings in 1,066 languages. They distribute these recordings using the Bible.is app for Android and iOS devices (and others). This requires that the user install the app from an app store. Due to licensing restrictions, the audio has to be streamed over the internet. This is a huge barrier (and in some cases dangerous) to many minority language communities. Renew Outreach works with FCBH to distribute the audio on lockable Micro SD cards and Wifi hotspots (LightStream) to be used in audio players and feature phones. With the changes made to Scripture App Builder (we are collecting usage data and transmitting when the user is on-line), now FCBH and Renew Outreach will be able to create apps with the audio and text bundled into the app and distribute the app virally. New Software, Come and Get it! Chris has been working with colleagues on porting Scripture App Builder to macOS for the past couple of years. 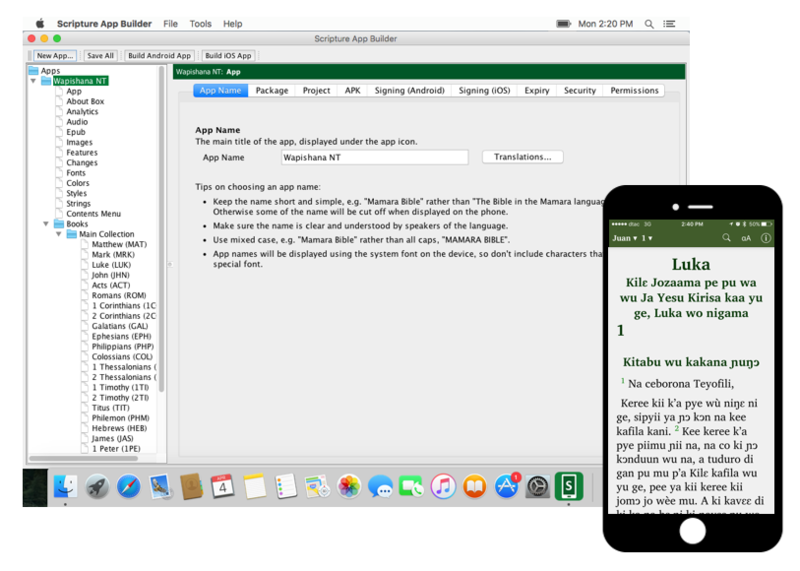 This program allows users to create Bible apps specific to a minority language that include synchronized text and audio that are easy to distribute. Best of all, the user can do this with no programming necessary. Before, users on Windows and Linux computers could only create Android apps. Now users of Mac computers can create both Android and iOS apps. We are very excited to announce the first release of Scripture App Builder for Mac!